Home Pest Control Sacramento: Are Ants Trying To Invade Your Home? As it begins to warm up more here in Sacramento, it is likely that many people will begin to experience issues with ants invading their home. While ants are dangerous and do not sting or cause harm, they can invade extremely quickly and become a nuisance even more quickly. The worst part? You can spray and spray to get rid of these pests and in many cases, they will simply come back again and again. On the other hand, ant invasions don’t just happen out of the blue. There are things that commonly trigger ants to begin infiltrating your space. In this blog post, we are going to discuss the most common causes an ant invasion and teach you how you can work to prevent them from happening over and over again. The most common reason that people find ants have invaded their home is that there is access to sugars or uncovered foods in the home. Ants are scavengers that will search all over your home to find any source of food. When they find it, they will send a message to other worker ants and before you know it, you have swarms of ants crawling all over your house to pick up food they can take back to the rest of their colony. If there are spilled crumbs on the floor of your kitchen, in the crevices of your counters, or anywhere ants can access, you are putting your home at risk of an invasion. Therefore, make sure rooms in your home are free of these things, especially your kitchen. Dog food is very enticing to ants. This is most often because it is easy to get ahold of. Many homeowners simply leave open bags of dog food on the floors on their home, making it easy for ants to gain access to. And it isn’t just dog food either. If you have any sort of pet food lying around, you are just asking for ants to infest it. In other cases, it might be that the problem is not what you have in your home. Instead, it could be that there are a number of ant colonies that are located too close to your home. You can find out if this is the case by having someone inspect your property for said colonies. They can then eradicate them and seal the holes in the infrastructure of your home that is allowing them to enter. 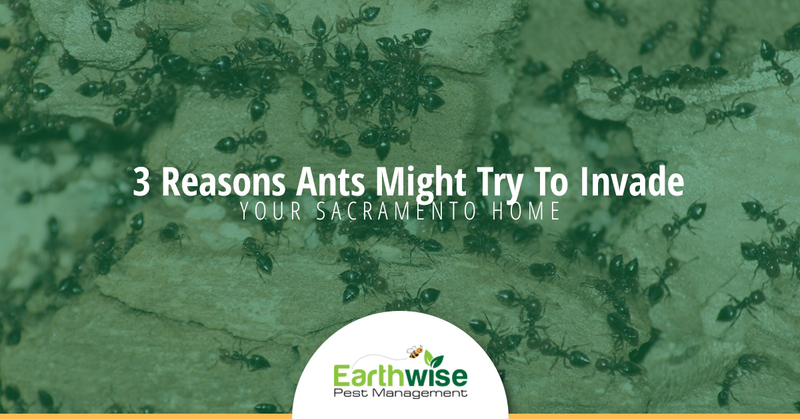 If you find that you have an ant problem at your home this spring, the first thing you should do is contact the expert staff at Earthwise Pest Management in Sacramento. We will do everything from determining what is causing your infestation to get rid of your ant problem altogether. Contact us at the first sign of ants and schedule an inspection. We would happen to alleviate you of you ant issue.